Wisconsin is blessed with 15,000 breathtakingly beautiful lakes that offer thousands of miles of scenic shoreline. Many lakes are natural and were created as a result of the retreating ice after the last ice age. Some were formed by impounding rivers and creating dams, and some are shallow and great for fishing while others are large and fantastic for boating and water sports. 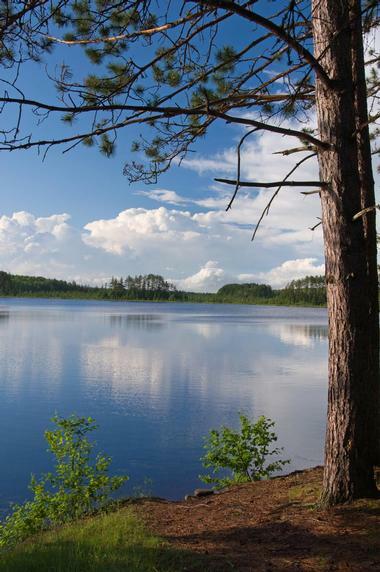 All Wisconsin lakes are a fisherman’s delight, surrounded by marshes or forests with lovely scenic hiking trails. 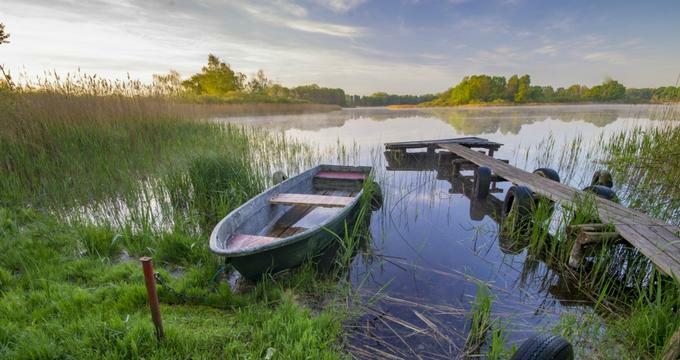 While some lakes have been considerably developed over the last two centuries, others are still fairly wild and unspoiled, protected in the numerous parks and reserves, and full of birds and other wildlife. Located in the Wisconsin's Kettle Moraine State Forest only 1 hour from Milwaukee and about 2 hours from Chicago, Elkhart Lake is one of the oldest Wisconsin resort lakes and has been a popular summer destination since 1860. The resorts around the lake were famous for sailing, bathing, and gambling. Of the 446 hotel rooms that existed at that time, many are still around, now renovated and updated. The shoreline is well developed, mostly with summer homes. There is a very active sailing club, and motorized boats are prohibited on Sundays, when sailing races are held. 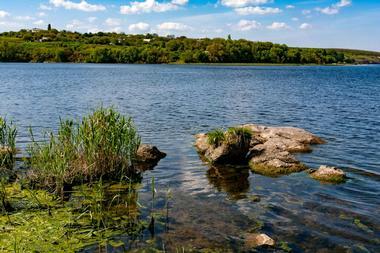 The clear, clean lake is very good for swimming and the fishing is excellent all year round. The area around the lake is popular for hiking in the summer and cross-country skiing in the winter. Located in central Wisconsin around 40 miles from Madison and 60 miles from Milwaukee, Beaver Dam Lake is a 5,540-acre man-made body of water with 39 miles of shoreline surrounded by rolling Wisconsin farmland. The lake was created in 1842 by impounding the Beaver Dam River with a series of dams that were to power a gristmill and a sawmill. The original dams were formed much earlier by beavers, giving both Beaver Dam Lake and the river their names. 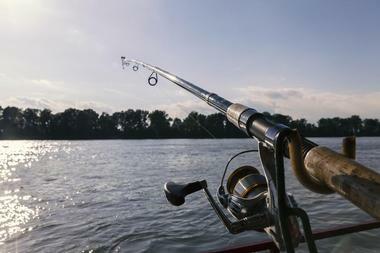 In spite of the average depth of only five feet, the shallow water is full of fish, particularly walleye, northern pike, crappie, bluegill, and large- and smallmouth bass. When the lake freezes in the winter, ice fishing is very popular, as is ice skating. There is a marina here, in addition to a few public ramps located along the shore. Green Lake, also called Big Green Lake, is the deepest inland lake in Wisconsin. This natural lake is also one of the oldest resort communities in the state. 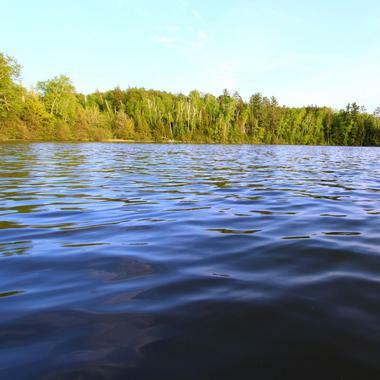 The spring-fed lake’s maximum depth is 239 feet and its water is exceptionally clean, with plentiful algae and many species of fish that require oxygen-rich water, such as walleye, largemouth bass, northern pike, muskie, crappie, bluegill, and lake sturgeon. The clear water of the lake makes it very popular for scuba diving, snorkeling, swimming, sailing, and kayaking. Nearby Horicon National Park is great for hiking and bird watching. Once the lake is frozen, many ice fishermen come to drop their lines. Castle Rock is a massive 16,640-acre lake in the Central Sands Prairie region of Wisconsin, in Adams and Juneau Counties. It, together with Lake Petenwell, was created by impounding of the Yellow and Wisconsin Rivers when the Castle Rock Dam was created. 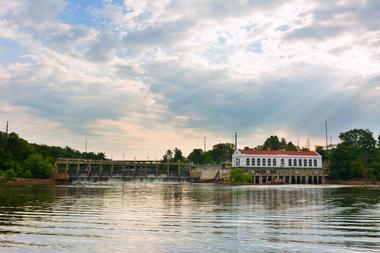 The dam is still used by the Wisconsin River Power Company to generate power for the area. 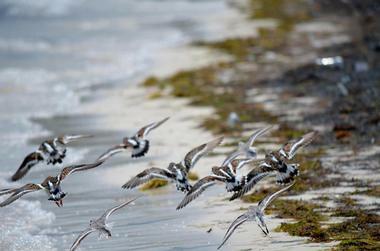 The coastline is largely undeveloped and natural, offering a home to many species of wildlife and birds. The shore is sandy, creating a number of lovely beaches. 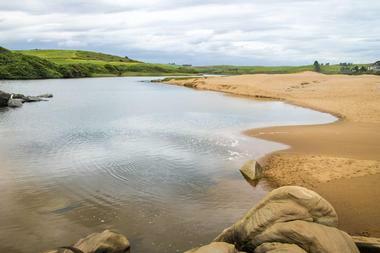 The Castle Rock County Park offers 300 campsites, a beach, and a boat launch. There are great hiking trails through the surrounding wilderness. Another park in the area is the Buckhorn State Park and Wilderness Area, located on a peninsula, where it is easy to spot Canada geese, sandhill cranes, herons, ducks, muskrats, otters, beavers and, in higher elevations, whitetail deer, wild turkeys, coyotes, and the occasional black bear. Crystal Lake is a 152-acre lake located in Sheboygan County with 3 miles of shoreline and, as it is spring-fed, it has clear, deep blue water. Most of the shoreline is developed and is dotted with both seasonal and permanent homes. There is a public boat launch in the bay at the southwest end of the lake. Fishing is the most popular activity, with great populations of walleye, northern pike, large- and smallmouth bass, crappie, bluegill, and perch. The use of motorboats is prohibited on Sundays, allowing kayakers and canoers to glide peacefully across the lake. Ice fishing is very popular in the winter and the surrounding area is great for snowmobiling and cross-country skiing. North of the lake is the Sheboygan Marsh State Wildlife Area, with scenic hiking trails and facilities for all sorts of activities. 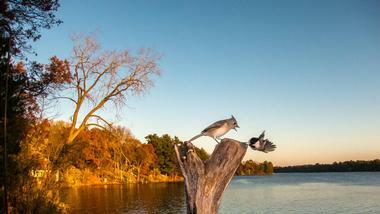 Delavan Lake is located in Wisconsin’s Southern Savanna region, about 63 miles from Madison and 87 miles from Chicago. The lake has been operated as a summer resort since the 1800s. There are several houses here that were designed by Frank Lloyd Wright and he even designed two boathouses on the lake. Although still heavily developed today, Delavan Lake is mostly used for sailing and water sports. The local yacht club organizes racing and regattas on the lake every summer. Fishing is excellent, especially for bluegill, muskellunge, largemouth bass, northern pike, smallmouth bass, yellow perch, and walleye. In the winter, there are ice fishing contests. A public boat ramp is located on the lake’s northeastern shore. Eagle Lake is a fairly shallow 515-acre lake in Racine County, Wisconsin. The most popular activities are fishing and boating, although the average depth of 6 feet means that the boaters have to be aware of shallow parts and avoid them, especially in summer when the water level drops. There are almost 5 miles of nice sandy beaches with a shady wooded shoreline. The lake is quite developed and there are very few unspoiled spots. Fishing is good all year around, especially for largemouth bass, perch, northern pike, bullhead walleye, and bluegill. On the lake’s northern shore is Eagle Lake Park, which features a boat launch, several sports fields, playgrounds, and picnic areas. 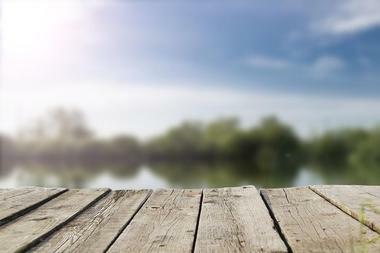 There is also a fishing pier, which is a great spot for kids to learn to fish. Fox Lake is located in Wisconsin’s southern savanna region and is known for its excellent fishing, especially for walleye. This glacial natural lake was enlarged in 1845, when a dam and sawmill were built on Mill Creek, raising the water level by 11 feet. The lake has six scenic islands and about 18 miles of shoreline. Fishing is by far the most popular activity, with a healthy population of northern pike, walleye, and crappie. Ice fishing in the winter is also very popular. There are several public boat ramps in the parks around the lake. Boat rentals are available, and kayaking is a great pleasure on the clear lake waters. Jordan Lake, also known as Long Lake, is a 213-acre lake in the Central Sands Prairie Region of Wisconsin, about 15 miles from Wisconsin Dells. 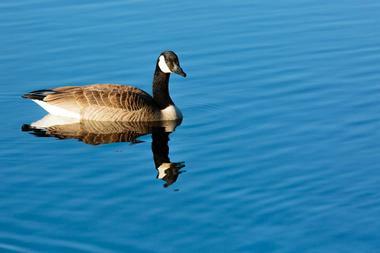 The lakeshore has been populated for a long time and most of the residents are there all year round. Besides water sports such as kayaking and swimming, the large number of birds that come to this area, such as bald eagles and sand hill cranes, make bird watching a popular activity among residents and visitors. The lake water is very clear, and although the areas along the shore are fairly shallow, there are much deeper holes that can reach as far down as 90 feet. A public boat launch is located at the lake’s western end, and bluegill, northern pike, largemouth bass, and walleye are plentiful, attracting local fishermen. In the winter, the network of trails is buzzing with motorized four-wheelers. Once a large marshland, Lake Butte des Morts was created by the construction of a dam on the Fox River in the 1800s, which flooded the area, creating a flat, shallow lake with the maximum depth of only 9 feet. Today, for the safety of boaters, there is a marked navigation channel across the lake. The lake is part of the Winnebago Pool and fishermen can enjoy catching the plentiful drum, carp, channel catfish, largemouth bass, smallmouth bass, and white bass. It is particularly famous for its lake sturgeon, which can reach up to 100 pounds. Winter ice fishing is also very popular on the lake. Lake DuBay is located in central Wisconsin near Stevens Point, in Portage and Marathon counties. It was created by impounding the Wisconsin River in 1943 for the construction of a dam and hydroelectric power station, which is still functioning. Anglers enjoy Lake DuBay for its healthy populations of walleye, bluegill, northern pike, and smallmouth bass. There is also ice fishing in the winter and there are several public boat ramps around the lakeshore. The most popular activities, besides fishing, are water-skiing, sailing and jet skiing, but simply exploring the lake’s hidden coves by kayak or canoe is also great fun. The 30.5-mile scenic Green Circle hiking and biking trail meanders through the dense forest and across wetlands teeming with birds. A popular lake resort for over 150 years, Lake Geneva is located in southeastern Wisconsin, not far from Madison, Milwaukee, and Chicago. The lake formed thousands of years ago in the depression left by the retreating glacier. The largest community on the lakeshore is Lake Geneva, a popular and lively town with a range of activities in downtown Library Park, Big Foot State Park, and all around the lake’s 21-mile-long shoreline. There are several golf courses, swimming beaches, rental facilities for canoes and kayaks, and water and jet skiing. The Pottawatomie Trail offers a pleasant and scenic hike around the lake. The lakeshore itself is densely populated and there are many lovely old homes in addition to several opulent mansions that have survived the centuries. Several lake cruises are available and provide an easy and pleasant way to relax on the lake. Lake Michigan is the largest freshwater lake in the world, covering 22,400 square miles with 1,640 miles of shoreline. There are about 80 lighthouses and a number of large islands. 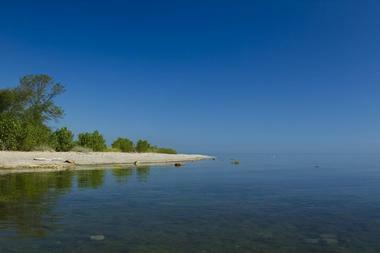 Wonderful sandy beaches along the lake earned Lake Michigan the name the "Third Coast" of the US. The lake and its shores are protected within several parks. Sleeping Bear Dunes National Lakeshore is located on the Lake Michigan's eastern shoreline and has beaches, spectacular dune formations, and dense forests, while Indiana Dunes National Lakeshore covers sand dunes, rivers, swamps, and wetland forests. Many other parks around the lake offer great hiking, camping, and nature exploring in addition to many other activities. Boating, kayaking, canoeing, and fishing are popular all around the lake. Lake Michigan is also home to a number of small and large towns and cities with a permanent population as well as summer homes for those who come to the lake to relax from the daily stress. 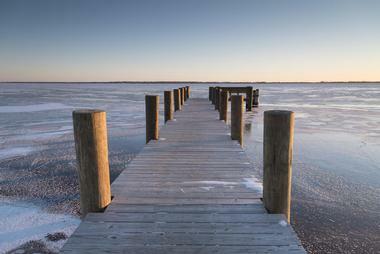 Lake Ripley is a 423-acre lake on the outskirts of the historic town of Cambridge. This glacier lake with clear blue water has maximum depth of 44 feet and is a very popular fishing destination. Most of its 5-mile shore is densely populated. On the western shore lies Ripley Park, owned by the Cambridge Foundation, with a lovely beach as well as tennis, basketball, and volleyball courts. There is a nice swimming beach and picnic areas, but no camping. Fishing on the lake is great for smallmouth bass, bluegill, northern pike, walleye, and white bass. Koskonong Creek, which runs from the lake, is popular with canoeists in the summer and, once it freezes in the winter, with cross-country skiers. 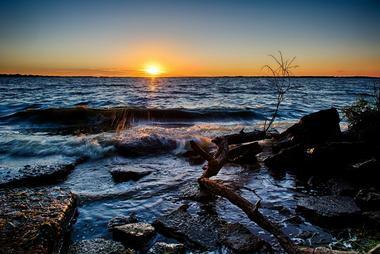 Located in Wisconsin’s Central Sands Prairie Region, Lake Winnebago is what is left of the much larger glacial lake that was created when access to Lake Michigan was blocked by ice about 12,000 years ago. Lake Winnebago is one of the largest natural freshwater lakes in the United States, at about 10 miles wide and 30 miles long. It is popular among boating enthusiasts, and for those who come to go sailing, water-skiing, or jet skiing. There are six lighthouses on the lake as well as several harbors, marinas, and boat ramps along the lakeshore. Fairly shallow, the lake has a number of islands, coves, and reefs, great for exploring in a canoe or kayak. Different parts of the vast lake have different fish populations, so anglers go where they hope to catch their favorite fish. One of the biggest parks on the lake is Calumet County Park, with a marina, swimming beach, and campground. A part of the vast 170,000-acre Winnebago Pool, Lake Winneconne is a popular 4,553-acre recreational lake, offering opportunities for water and jet skiing as well as boating and leisurely showboat cruises. Fairly shallow, with a maximum depth of 9 feet, Lake Winneconne is full of fish, particularly largemouth bass, smallmouth bass, white bass, catfish, walleye, and northern pike. Catching a lake sturgeon is every angler’s dream, either in summer or in winter through a hole in the ice. There are several public boat landings along the lakeshore. The largest community on the lake is Lake Winneconne Village. Little Cedar Lake is a 246-acre natural glacial lake located near West Bend, Wisconsin, in the Kettle Moraine area. Kettles are deep depressions that formed when the ice melted under an accumulation of sand and gravel during the last ice age. Many of these depressions became lakes and Little Cedar Lake is one of these. The lake has spots that are more than 100 feet deep, but its average depth is 56 feet. It is surrounded by dense forests of pines and hardwoods. This clear, clean lake is very popular for boating, fishing, and watersports. The lake has about 4 miles of shoreline and offers great fishing for bluegill, large- and smallmouth bass, and walleye. In the winter, the lake is covered with ice-fishing rigs. The only public access is a boat ramp at Ackerman's Grove County Park, a lovely park for hiking and with the beautiful views of the lake. Pike Lake, a 522-acre natural glacial lake, is located near Hartford in southeast Wisconsin in Washington County, about 25 miles from Milwaukee. 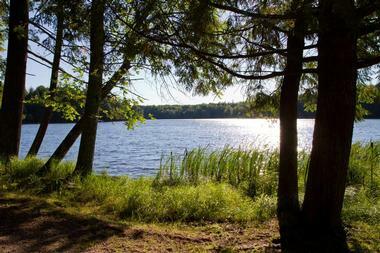 Pike Lake is surrounded by dense mixed forests and is a popular spot for boating, kayaking, fishing, and picnicking. There are several swimming beaches in the Pike Lake State Park, together with a campground, playground, and a picnic area. Powder Hill in Kettle Moraine State Forest is one of the highest points in southeastern Wisconsin and offers great hiking trails and views of the lake from a 60-foot observation tower built on top of the hill. 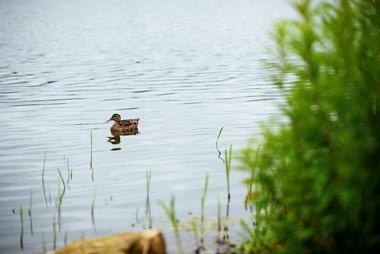 There are other hiking trails around the lake, providing occasional encounters with the local wildlife. Pike Lake is famous for great walleye pike fishing, but northern pike, bass, and pan fish are also available. Powers Lake is a 450-acre natural lake in southeastern Wisconsin about 40 miles from Milwaukee, and is popular for sailing, water-skiing, and swimming. Powers Lake Yacht Club is very active, organizing races and also offering training. There are two parks on the lake’s southeastern shore with municipal boat slips. The boat traffic on the lake is heavy in summer, with noisy powerboats pulling skis, tubes, and wakeboards. There are two free public boat launches for smaller boats. Fishing is good for large- and smallmouth bass, walleye, northern pike bluegill, and panfish. There is an annual ice fishing tournament on the lake. The lakeshore is densely populated with a number of luxury homes. Lake Poygan is located in Wisconsin’s Central Sands Region in Winnebago County. The 14,000-acre glacial lake is shallow, only reaching 11 feet at the deepest spots, making boating risky and at times impossible. Originally, the lake was even shallower and used to grow rice by the locals, but the construction of a dam in 1849 raised the water levels in order to improve navigation. While the levels indeed rose by 3.5 feet, it destroyed the rice farming industry. Poygan Lake is excellent for fishing and has plenty of largemouth, smallmouth and white bass, northern pike, and walleye. The lake also has a large population of lake sturgeon, which at times can grow to 100 pounds and live up to 100 years. In the winter, the frozen lake is full of ice shacks and hopeful fishermen. 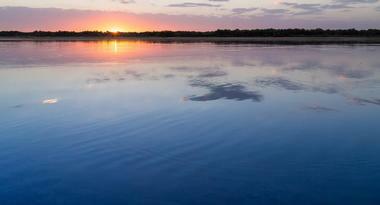 Lake Puckaway is a 5,000-acre lake located about 90 miles from Milwaukee in Wisconsin's Central Sands Prairie Region. The lake is long and shallow, resembling a wide spot in the river rather than a lake. It is only 3 feet deep on average, making it great for fish but poor for boating. The Princeton Dam was built in 1897 to increase the depth of the lake and allow freight steamer navigation, but there was just not enough water. Most of the lakeshore is a marsh covered in reeds, making the lakeshore inhabitable except for one small part, where most summer residences are located and which has a nice sandy beach that is perfect for kids. The lake is full of fish, especially walleye, northern pike, muskie, large- and smallmouth bass, crappie, bluegill, perch, and lake sturgeon. There are a few public boat launch spots around the lake. While motor boats find it hard to navigate the lake shallows, it is great fun to explore it in a kayak or a canoe and look for great blue herons and double-breasted cormorants. Rush Lake is a 2,729-acre lake located near Oshkosh in Winnebago County. With a maximum depth of 5 feet, Rush Lake is a shallow marshy lake with great wetland areas, the result of water level fluctuation in what is known as prairie pothole. Only 1 percent of Rush Lake has a hard bottom; the rest is soft muck that is 20 feet deep in some areas. The boating is not as great as slow gliding in canoes and kayaks, but the bird watching is fantastic – it is not unusual to spot the rare red-necked grebe, forester's tern, black tern, American coot, and common moorhead. Fishing is excellent too, especially for northern pike, crappie, bluegill, and large- and smallmouth bass. The Owen and Anne Gromme Preserve, managed by the Nature Conservancy, is the best spot for bird and wildlife watching. Shawano Lake is a 6,178-acre jewel of a lake in eastern Wisconsin, with an average depth of only 9 feet and a dam along Wolf River, which controls the water level. With plenty of fish, Lake Shawano is a favorite spot for many anglers, who come for walleye, northern pike, and largemouth bass, and there are popular fishing tournaments on the lake every year. 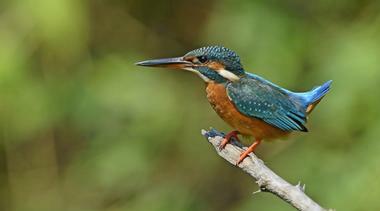 The surrounding area is rich in wildlife and is an important resting stop for migrating birds. 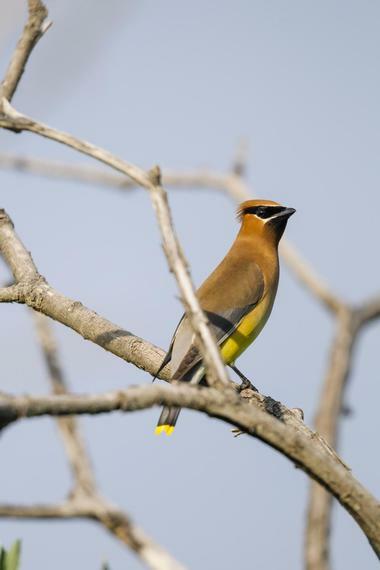 Hikers through the area can spot bald eagles and redheaded woodpeckers as well as plenty of different species of waterfowl such as geese and ducks. 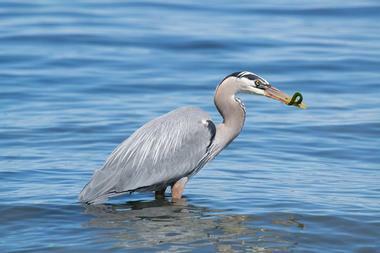 Visitors are permitted to go to private Schumacher Island to observe nesting birds in the shallow marshes. The lake is wonderful for kayaking and canoeing, and there are also nice sandy spots for swimming. Sinissippi Lake is a 3,078-acre lake located not far from Hustisford in Dodge County, surrounded by rolling farmlands and hills. It is a shallow lake with a maximum depth of only 8 feet. The lake was created by impounding the Rock River in 1800s with a log dam. Agricultural runoff is causing the lake water to be too rich in nutrients and very poor in oxygen, making it hard for fish to survive. Only bullhead and carp can still be found here. It is very popular for water-skiing, and the local club Sinissippi Ski Club offers lessons every summer. There are eight scenic islands on the lake and a very popular camp on the Radloff Island, also called Campers Island, which is the largest. Bird watching around the lake is fantastic, and it is not rare to spot bald eagles, herons, sandhill cranes, and white pelicans. 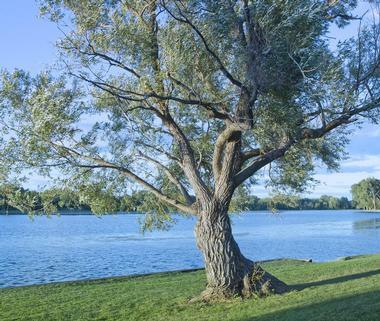 The Yahara Chain of Lakes was created from a boggy expanse left over from the last ice age. It starts with Cherokee Lake, crosses Madison and is linked by parks, beaches, picnic areas. and nature trails. Cherokee Lake is not much more than a wide point on the Yahara River that was created after a dam was built in 1850. Surrounded by wetlands, it is popular for kayaking, canoeing, and bird watching. Lake Mendota has a 22-mile long shoreline and includes beautiful Governor Nelson State Park, with a fine sandy beach, a number of boat launches, and 18 miles of hiking trails. 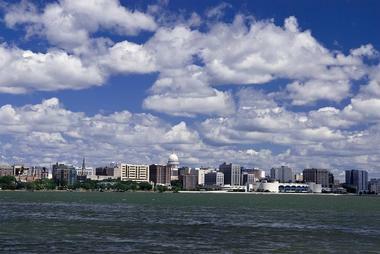 Lake Monona is located almost in the heart of the City of Madison and is surrounded by cottages and summer residences. It is popular for water-skiing, boating, tubing, and other sports. 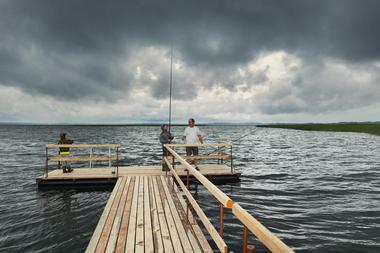 It is also great fishing lake. Lake Wingra is fairly small and undeveloped and no motor boats are allowed on it. It includes the University of Wisconsin–Madison Arboretum and has a swimming beach and miles of hiking trails. 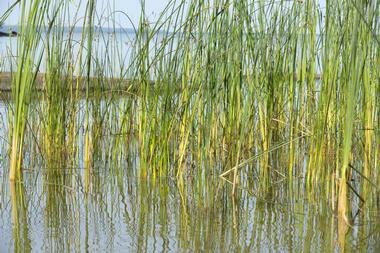 Mud Lake is surrounded by wetlands and is a great spot for bird watching.